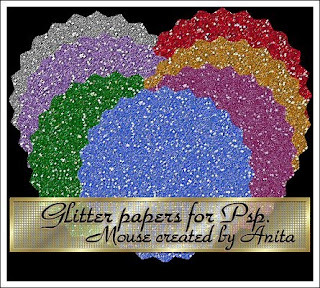 I have spent ages playing around creating glitter papers for Psp that are suitable for tag size images. These are 500x500 jpg format. Please feel free to re-colour to suit your own projects. Love the Halloween Background Anita - Very spooky! ooohhhhh aaaahhhh so pretty! Thanks! Thank you so much for this Freebie. I want to let you know that I posted a link to your blog in CBH Digital Scrapbooking Freebies, under the Page 3 post on Nov. 20, 2009. Thanks again. Thanks for sharing the glitter papers!